Tips to help your new vehicle adapt to daily driving. Smell that? Yep, that’s the new car smell. Ahead of you and your fresh set of wheels lie new roads to explore, new features to play with (hello, ipod jack) and fewer visits to the mechanic. But as much as you want to zoom around without a care in the world, you might want to hold off for a bit; your new lease on life needs a little extra care during its first thousand miles or so. It’s called the break-in period, and it’s essential to your car’s wellbeing. Like your feet in a new pair of shoes, your car’s parts need time to settle in before you break into a run. First things first: read the owner’s manual. Buried within the hundreds of pages are stipulations for the recommended break-in period and your particular model’s maximum speed and engine revs during that time. Trust it; they did build the car, after all. What the break-in period is all about comes down to the piston rings. These particular little bands don’t perfectly fit within the cylinders when the car is first assembled (we’re talking a teeny tiny, miniscule amount of space between the parts). The driving time your owner’s manual recommends is how long it takes for the piston rings to settle into place and create a tight seal that can’t leak oil. Most modern cars usually come with a recommended break-in period between 600 to 1,200 miles, though there are some variations. Err on the side of caution if you feel uncertain about the timing – a few thousand more miles of easy driving will only continue to protect your car’s working parts. Now that we’ve established how long you should perform this care, let’s discuss what it actually entails – patience, determination and restraint. No, really, those traits are pretty important when you’re looking at a restricted speed maximum and rev limit. Ultimately, the first thousand miles are all about gentle, unenthusiastic driving – the last thing you want when you’ve just bought a car. Try your utmost to not rev the engine higher than 4,500 rpm, and certainly not up to redline for the entire break-in period. By keeping the spindle on the tach nice and low, you’ll let those piston rings settle into the role they’ll perform for thousands of miles. 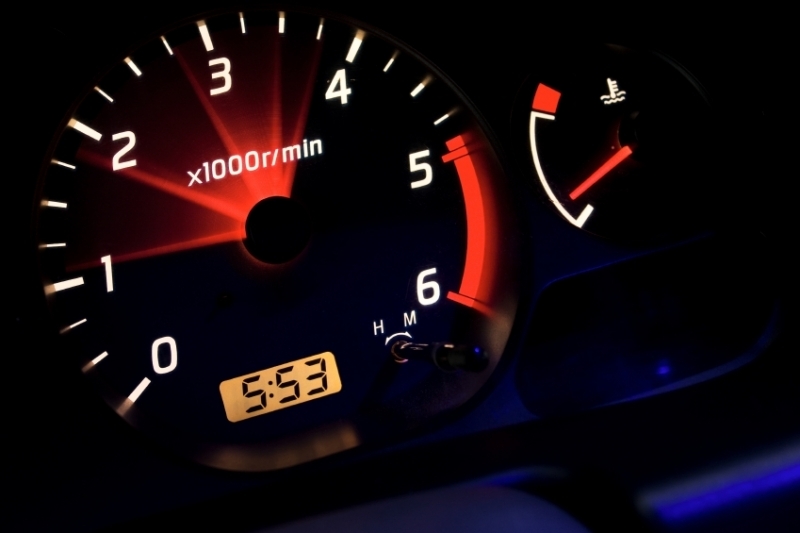 If your car doesn’t come with a tachometer – some vehicles just don’t provide one – you’ll have to go by sound and feel to determine the stress on the engine. To avoid excessive wear, keep gentle pressure on the throttle instead of pinning it to the floor. The quieter the engine, the more you’re coddling it – exactly what you want to be doing. If you can suppress your need to hurriedly accelerate when a light turns green or when you’re late for work, you won’t be looking at a ghastly bill for a new engine at just 100,000 miles. As the owner’s manual also mentions, keep your speed down. You may have that shiny new car with horsepower to burn, but control yourself for the allotted time period. This doesn’t mean that you should go the same speed all the time. It’s important to vary your mph and shift through gears as often as possible. We’d also recommend getting your oil changed soon after the purchase – usually right around the end of the break-in period. It isn’t necessary, but all the little flakes of machinery that have rubbed off during your car’s initiation period can get mixed up in the oil. It’s best to change it and really start afresh. As important as the break-in period is, don’t freak out if you happen to hit redline once or twice during it. You won’t destroy the car. Take a deep breath of that new car smell and know that everything will be ok.